A selection of colors as diverse as the water fish are found in. Some water is bright; others dark, some are muddy while others are crystal clear. 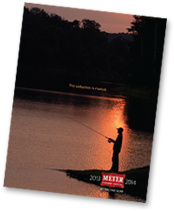 No matter where a fisherman drops his line, there’s a Meter tackle color that will make their day a success. Best Seller - These big sellers are the most in demand product within each category. Be sure to order plenty because they're hard to keep in stock. Top Pick - Anglers depend on these items for a great day fishing. You can depend on them for great sales.